Please rate every map with the points you think it should get. The more people rate, the more the rating is correct. A lot of great maps have no rating at all, while others have. If you want to, you can also look some old or random maps up, and rate them. Thx. And here is the BWMN-Logo for our BWMN-Mappack. I will edit all pictures for the mappack. Just take a look at Shangri-La or Temple of Eden now. 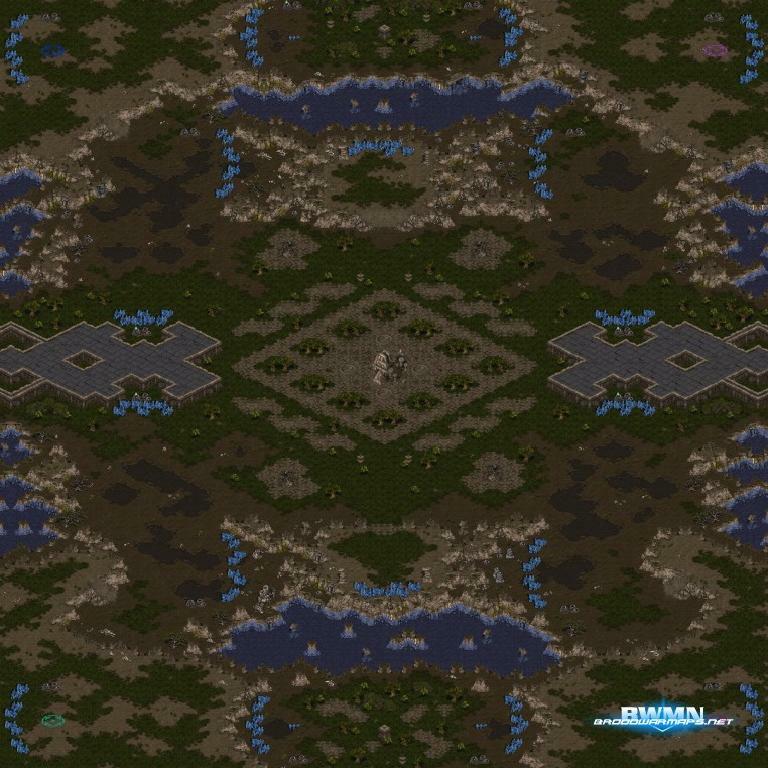 A lot of interesting features were used to make this map with a rather classic mainbase-layout something special. (4)Temple of Eden has two double-island expansions at twelve and at six O'clock, that are very valuable and pretty vulnerable at the same time. Something you do not see every day is the mineral only-expansion that turns into a gas expansion after mining down the minerals. And, just like Regnum noctis, but on jungle tileset, Listoric used custom ramps to make the access to 12 and 6 mineral only expansions. because of personal problems, especially problems with myself and what i'm doing or not doing at the moment, i will stop visiting this site as heavily as i did the past months, just fly by every now and then. I have just to make a serious pause from any Online activity atm. I may be seen on B.net sometime to play usermaps or stuff. Anyway, i really have a big problem with myself and my online activitys after i'm on my PC 24/7 and that is just not good at all. I will still be here as an Admin to help things running. Anyway, i'll be here seldom for the next weeks, keep on mapping and everything. 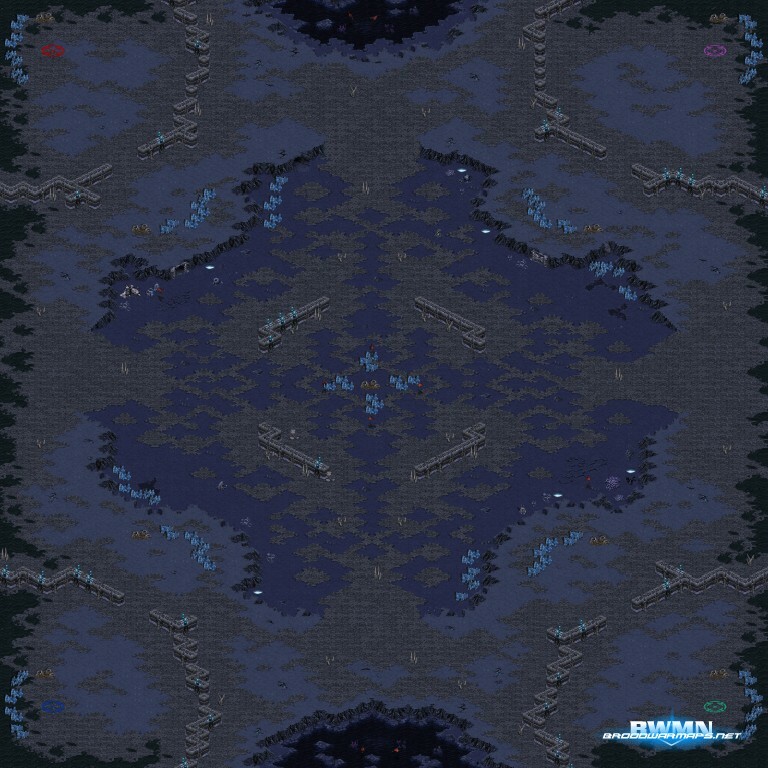 After some weeks with very hard arguments for the MotW, this time there was not much competition for this title, as some of the best maps in contention proved to be not "final" yet, and the winner being a really excellent map. Starparty, who already had four MotW since we started in july, created another masterpiece in (4)Shangri-La. It uses the twilight ramps in every direction very well that were introduced to us by Djin)XuuL( with his map (4)Regnum Noctis earlier this year. The placement of the expansions is rather conventional on Shangri-La, with the exception of the middle expansion, that can be mined from every direction. The map has already been played a lot by Starparty, Listoric and myself and proved to be much fun and well balanced. The next MotW-Tournament by gosugamers.net will be played next weekend, Shangri-La will not be in the mappack though, but next month it will be. We have a problem with this weeks MotW tour. Our eventmanager Zoxxer is unable to attend this week and therefore we have noone to organize the tour. We have searched desperatelly for someone with experience in organizing an event like this, but with no success. Therefore i ask of you at bwm.net, if there is anyone who feels he knows what to do and how to arrange things, please send pm to Zoxxer on gg.net and work it out there. The only other alternative is that the tour will expire this week, and that would be a serious blow for the continuality of the MotW tour, not to mention that 4 MotW's will not get the award they deserve. Please solve this issue as soon as possible. We could all try and pull it of togheter, i know i will definitelly attend if anyone wants me to.